Anyone involved in the solar module business for the last few years can’t help but be amazed at the dramatic swings in opportunity. The drama has been high─who will win, who will lose, when will the market stabilize? Dr. Peng Fang, CEO of JA Solar, one of the largest PV cell manufacturers in the world and a rising star on the module market, talks about JA Solar’s core competencies and 2012 strategies. This article preliminarily compares interconnection processes for small residential applications as well as larger commercial- and utility-scale projects in California and Germany to identify important differences. This work is meant to be a starting point to better understand and inform the different interconnection processes. This final of three articles examines the PV market in Portugal, Slovenia, Spain, and the U.K. Each factsheet consists of National Data, PV Industry Survey Results, Barriers and Recommendations, and Results and Future Development. Integration of growing solar PV power with smart grids will usher in a new energy sector. However, implementation of large-scale solar power plants faces significant challenges because of its integration with the power grid. Reliable solar resource information can give answers to many questions. It is important not only for mitigating financial risk involved with a project but also helps choosing the most suitable technology options. We have seen tremendous growth and expertise built around solar PV as a renewable industry since 2008 in Gujarat, India. The U.S.A. seems to be the ideal location for large-scale solar development. But what seems to be a perfect location actually can be an exceptionally difficult one. We will discover why. By applying a carbon tax, the solar industry could rapidly accelerate the deployment of technologies in Taiwan and allow the industry to experience considerable growth. Such a move might result in the dawn of a new sustainable age in Taiwan. PVCON 2012-2013 (PV WORLD CONFERENCE AND BUSINESS FAIR) takes place on September 6, 2012, in Seoul, Korea. The first Reneable Energy Credits spot market held over two days for solar PV on February 28th and non-PV on February 29th got off to a smooth start. A 28-year semiconductor technology expert and newly appointed CEO of STX Solar, Dr. Choi Jin-seog argues that the solar players need to see the market from a different perspective. “It’s not a crisis. It’s an opportunity,” says Shin Dong-jin, Director of Phtovoltaic Sales & Marketing at LSIS. “Because we are different,” he adds. What is LSIS doing different? 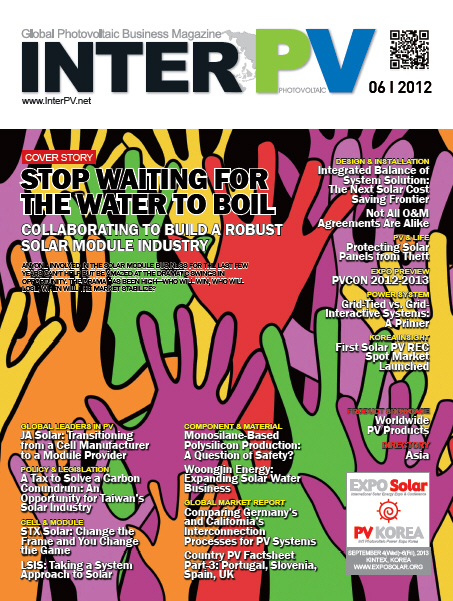 InterPV Editor-in-Chief Jeanny Lim sat down with Shin to talk more about this. Thin-film silicon manufacturing technology has improved rapidly to keep pace with a fast-changing landscape. The latest generation production lines for thin-film silicon have an estimated manufacturing cost of just US$0.50 per watt, highly competitive even in turbulent conditions. In the wafer production, the preliminary process step of adhesive glueing of silicon bricks onto wire-saw beam is quite often severely neglected. Monosilane-Based Polysilicon Production: A Question of Safety? Innovative technologies like monosilanebased polysilicon production offer the potential to retain competitiveness in a quickly changing market. Woongjin Energy CEO, Lee Jae-gyun talks to InterPV about their continuous efforts to achieve their goal─releasing cost competitive and high-efficiency products to suit various market conditions. After a generation of renewable energy choices that required integrators to either tie systems to the grid or shun the traditional source of power altogether, the development of grid-interactive PV inverter systems signals a better future. A customized O&M plan that suits the needs of the asset managers, owners, and investors ensures the highest performance levels throughout the system life cycle. Leadcom Integrated Solutions designed and successfully implemented three largescale solar power systems for one of the world’s largest telecom operators. Over the last three years, the solar industry has grown and as with any new industry, the more economic output equals a number of security issues. Iris Krampitz, Founder of Press Agency Krampitz, felt a need to explain to managing directors and marketing & PR heads of solar and other high-tech companies about her experience and marketing communications expertise.